train or tube, with all staff and pupils then converging in the Cathedral Piazza before taking their places for the Mass which began at 2pm. It was quite a feat of logistics and timing, and a far cry from the first ever day of Wimbledon College, founded by the Jesuits in 1892. On that day, only two pupils were expected: a pair of brothers with the surname Lloyd. Thomas arrived as expected, but his brother, William, had fallen ill. Thus the history books show that Wimbledon College began its history with a rather inauspicious 50% attendance rate! Head Master, Mr Adrian Laing, opened the Mass with a warm welcome to all boys, staff, governors and guests. Among them were a good number of priests from the Jesuit community, all of whom had links with the College, be it as Head Master, chaplain or teacher or indeed as pupils. Several had been both pupil and staff member. Though Mr Laing is the first member of the laity to lead the school, he continues to pursue the original vision of its founders: to develop young men of integrity who put others first; and to do all things for the greater glory of God. Boys of the school, aged 11-18, enjoyed the rare opportunity to wonder at the awesome scale of Westminster Cathedral and its magnificent sculptures, mosaics and marble-work. 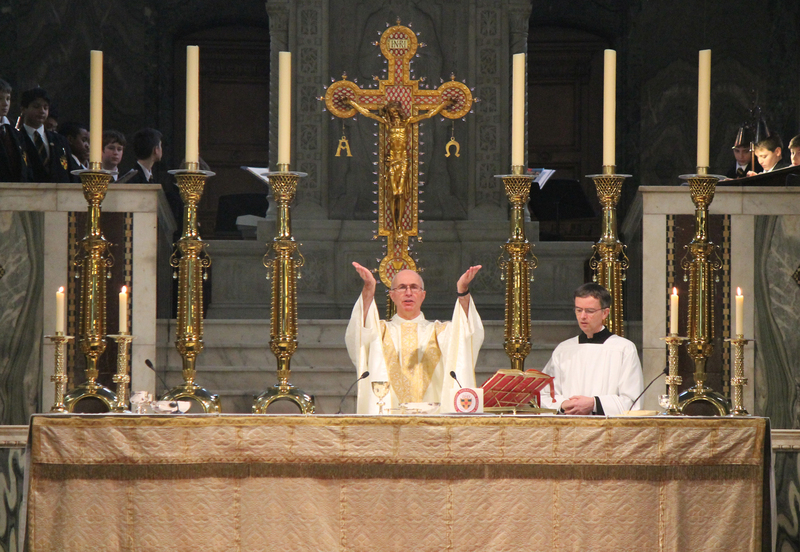 Father Dermot Preston SJ (Society of Jesus) presided and delivered the homily. In it he used the example of Nelson Mandela as someone with a huge spirit and gave credit for the way that, over the past 125 years, Wimbledon College had sought to nurture a person's spirit as well as their intellect, gifts, virtues and talents, thereby forming that person's true character. Head Boy, Tareeq Jalloh and other current pupils were involved as readers, servers and in the College's excellent choir. The Mass was concluded with the choir and congregation giving a rousing rendition of the College's traditional closing hymn, 'I the Lord of Sea and Sky'. The 125th anniversary Mass was a fine way for present staff and pupils to pay respect to the history of Wimbledon College, while continuing the best parts of that tradition through the present and on into the future with, to borrow the words of the Head Master, 'Christ very firmly at the centre of it all'. Mr Laing said: "It was a wonderful occasion for the whole school to come together, something we cannot do easily given our size, to thank God for the life of the College. The boys were outstanding, both at the Mass itself and during the journeys to and from the Cathedral. The sight of the whole school filling Westminster Cathedral will remain with me as I am sure it will for the staff and pupils."